Extremely strong replacement giving you the look and feel of natural teeth. Dental implants are metal cylinders made of titanium. They are placed in the jawbone where teeth are missing. Implants replace the roots of missing teeth and support single crowns, large bridges and dentures. State-of-the-art technology makes it possible for these implant-supported replacement teeth to look, feel and function like natural teeth. Implant Crowns or “caps” are attached to a implant which has been placed in the jawbone. Typically the implant heals for 3-6 months before the crown can be attached. The implant crowns can either be screwed into the implant, or an abutment can be attached to the implant and the crown can be cemented onto the abutment. Implant Bridges are similar to traditional bridges in that they are connected to 2 implants (just as a traditional bridge is attached to 2 teeth). 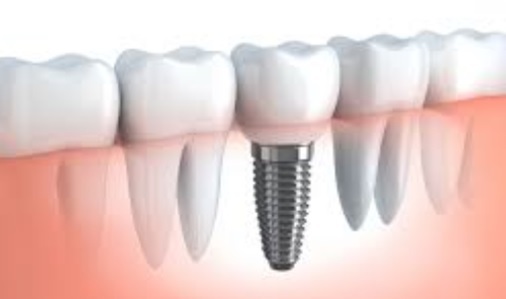 They can be either screwed into the implants or cemented onto abutments, just like implant crowns. Your prosthodontist will act as the quarterback when it comes to planning for implants. Evaluation of the spaces for the new teeth will be done, and a CBCT will be taken so that the bone levels can be evaluated. Typically, the surgeon or periodontist will place the implant into the bone. If it is stable, a fixed temporary tooth can be put on that same day. If it is not stable due to poor bone quality, a removable temporary tooth will be given to the patient. After 3-4 months of healing, the implant is ready for the final tooth. An impression of the implant is made, and the lab fabricates a tooth which is then either screwed or cemented onto the implant. You have a broken tooth that cannot be saved. You want the look and feel of natural teeth so that you can eat, speak, and smile again.